Speaker of the House Paul Ryan presents the Congressional Gold Medal to the U.S. Army 65th Infantry Regiment. A Congressional Gold Medal was presented April 13 during a ceremony in Emancipation Hall in the United States Capitol Visitor Center. The ceremony was held in honor of the 65th Infantry Regiment, the Borinqueneers. The Borinqueneers, a segregated unit of the U.S. Army formed by Congress in 1898 and comprised of Puerto-Rican and Latino men, heroically served on behalf of the United States during World War I, World War II and the Korean War, despite prejudices. The Speaker of the House, the Honorable Paul Ryan, asked the attendees, “Would you fight for a country who discriminated against you… it takes a certain caliber of man to do that.” Looking around the room, the humble Borinqueneers, wearing ball caps or flight caps displaying some of the military’s highest commendations, sat quietly and proudly. For they already had answered the question. The ceremony was more than just that—it was akin to a large family reunion. Each time the United States Army Band performed a Puerto Rican song, the audience sang proudly while waving flags of their homeland and wiping tears of pride from their eyes. The day was a particularly special one for one United States Mint employee – Idalia Smith (Manufacturing Finance and Systems Support). Her father, Wilfredo De La Paz, served as a Borinqueneer. Smith attended the ceremony in his memory. Wilfredo De La Paz of Puerto Rico enlisted in the U.S. Army in 1940 at the age of 18. The young private soon found himself in the grips of World War II, jumping out of airplanes as a paratrooper with the Borinqueneers. While cultural difference were common and accepted in Puerto Rico, the U.S. Army felt differently about the matter at the time De La Paz served. Smith recalls her father speaking about brothers that could not eat meals together because they had different colored skins. He separated in 1945 after the end of the war. 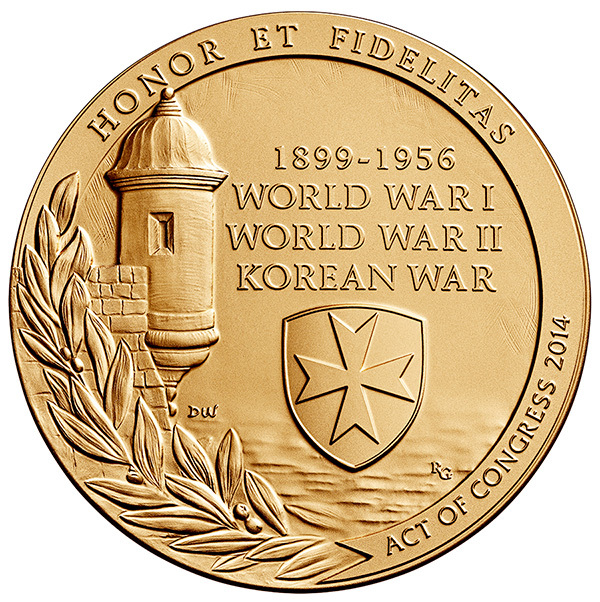 Bronze duplicates of this Congressional Gold Medal, produced at the Philadelphia facility, are available for purchase in 3 and 1.5 inch sizes. 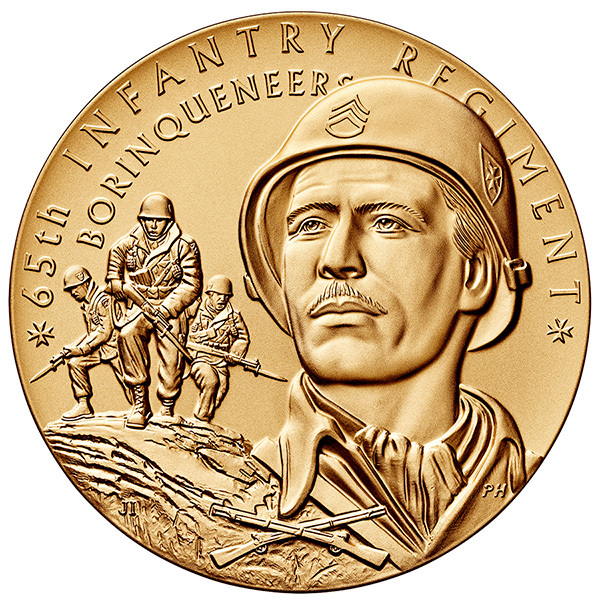 The obverse design depicts a portrait of a fictional Borinqueneer. The soldiers in the background are in an inverted “V” formation, taking the high ground with fixed bayonets during an assault on the enemy during the Korean War. The inscriptions are “65th INFANTRY REGIMENT” and “BORINQUENEERS.” The crossed rifles insignia appears at the bottom of the design.